Eh, give face a bit lah. Don't boo at me lah. Listen first. I said so 'cause I really spent more time staying at home than hanging out with friends, for some reasons. I even lazy to go out for a lunch or dinner or mamak stall and imagine did not step out even to the car porch during the weekend days until Monday when go to work. And I work in KLCC, the most happening area in the capital, I don't even know what pubs, discos, dining restaurants and so forth surrounding my office. Yeah, shameful to say I still know very little until today, even what shops available in KLCC. :") One particular reason is I hate to hangout in KL. Hmmm... Which one to start first? Need not say much, it's a chocolate specialty restaurant, but it serves other food as well, visit the web site for details. The cakes were good, not so sweet. Again, sweet things usually taste good for everyone's tongue. If you are a chocolate lover, worth a try, though the price is on the high side for the chocolates but the meals like lunch set is quite affordable. It's attached at the bottom left of the application form. The card entitles us a 10% discount for next visits and immediately on the 2 cakes we had! So basically we paid nett price for the food without the 10% tax. Thanks Mr. Berry! To be checked or to be check? Noticed the sauce was in different color? We asked the question and was told "picture one is the wrong sauce". What can you say more?! So if you were tempted by the menu here, warn you, you might be disappointed by its real serving. The platter tasted so so and one commented a bit tasteless. Since it's pub, the happy hour begins from 6pm for 9pm. We were told the first bottle of Tiger Beer (the only beer) was RM23 nett followed by subsequent bottles for RM0.50 nett, so it should be RM24.50 for 4 bottles. It was indeed true but the waiter did not mention per pax! So it's RM23 nett per pax per first bottle, ended up the bill (for beers only) was RM92! I did not feel I was cheated like my friend did, she was so upset with it, may be some after effect of alcohol. Certainly it's a miscommunication with the waiter as the waiter could not speak fluent English, though we did clarify with him beforehand and he said yes for our calculation of RM24.50. Anyway, I don't like Tiger Beer, but I think it's a worth deal if you and gangs could at least drink more than 2 bottles per person in 3 hours time. Oh ya, you must have RM0.50 coins, not 2 x RM0.20 + 1 x RM0.10 to get your subsequent bottles. This was what I was told, (by the waiter again) but I saw few RM0.20 coins in the collection bucket. Overall, the place is nice for hang out with friends or loved one or even with family. In addition, it's generally hard to get good food (or even yucks type of feedback) in such hang out places, you pay the price for the atmosphere and setup, but SohoKL is an exception, the food was tasty, in particular the Biz Cafe. Plus the price is reasonable and not so crowding like those places in KL city center, certainly you feel relax here. I shall correct myself that I hate to hangout in KL city center since this place is called SohoKL, but I am cool with KL suburbs like this area. 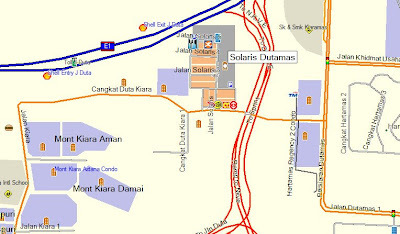 I can't really locate myself when I'm in KL, but the GPS brought me there when I entered Solaris Dutamas into my route. And I certainly sure I was at SohoKL as you can see from the first pix.